Weekend of Food and Wine Includes an Intimate Seminar with Marc Mondavi! 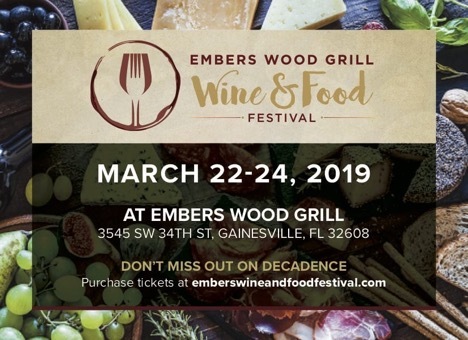 Gainesville’s own, Embers Wood Grill and Spark invite you to spend three days indulging in gourmet cuisine, fine wines and live music at our third annual Embers Wood Grill Wine & Food Festival! Start the weekend on Friday, March 22 with our Winemaker’s Dinner at Embers Wood Grill. Award-winning and talented Executive Chef Briton Dumas will marvel you with a magnificent multi-course dinner complimented by the legendary wines of Jordan from Napa Valley. Saturday, Embers and Spark will host events for the second time in North Central Florida. The Bourbon Bash sold out months in advance last year! Also on Saturday, Embers offers a Seminar with Marc Mondavi and Charles Krug Winery. A third generation member of one of Napa Valley’s most prestigious wine-making families, Mr. Mondavi will present his award winning wines from Charles Krug Winery. Mix and Mingle with Mr. Mondavi during a welcome reception featuring passed hors d’oeuvre and Domain Ruinart Blanc de Blanc. Guests will then be seated for Mr. Mondovi’s seminar. During the tasting presentation and seminar, Mr. Mondavi will discuss each wine and vintage as they will be paired with flavors and tastes to enhance the experience of the wines and port. The VIP Package offers access to the Wine Makers Dinner and this ticket also is entrance to the Embers Wine and Food Festival VIP Preview Party at 1pm on Sunday. Embers Wine and Food Festival on Sunday offers guests the rare opportunity to sample more than 200 wines, champagne, and liquors that have been personally selected by our certified in-house Sommeliers Ryan Todd and Justin Hall. Visit the round room to sip Champagnes you’ve never had access to before! Like last year, our Signature Rooms will include the very popular cheese room filled with artisan cheeses from around the world, specialty desserts, seafood, and raw bar and an outdoor grill station, all executed by award-winning Executive Chef Briton Dumas, Sous Chef Jason Lawnicki and the Embers and Spark culinary teams. These events help provided students from the Eastside Culinary Program with scholarships! This decadent festival has now set the standard for epicurean events in North Central Florida. Guests must be 21 or older. Event held rain or shine. Please visit Embers Wine and Food Festival for more details and ticket information.